This completely restored German Farmhouse was built in 1920 by Otto Schneider who owned the local grocery and bottling company. Upon entering this historic property, you’ll notice it is appropriately named The Stone Well Haus because of the well located in the living room. Although the well was previously located on the back porch, it wasn’t uncommon for homes to have indoor cisterns to have access to fresh water. Expertly restored in 2016, the well is now covered and used as an end table and conversational centerpiece in the large open concept living, dining, and kitchen area. With plenty of windows to the back yard, this makes it the ideal place for entertaining both indoors and out. 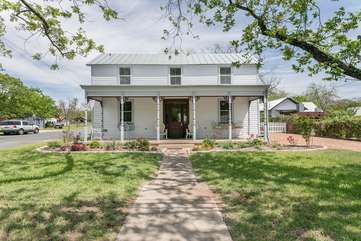 The house is perfectly furnished throughout with a mix of modern furnishings and the owner’s family antiques including a loom built in 1879 and a pie safe made by your hostess’s great great grandfather. The master bedroom offers the perfect retreat with an iron king size bed and neutral linens with an en suite bath. Located up the original wood staircase are the other two bedrooms, second full bath, and writer’s nook. The second King suite is large enough to be a second master and just as tranquil with a bath right outside the room. Two charming twin beds are located in the third bedroom providing a perfect haven for kids or additional guests. The Stone Well Haus is also the perfect place for Fido! Your hosts have provided everything they might need including dog crates, bowls, and a fenced in yard making it the optimal getaway for everyone. This is our third year for our Fredericksburg family thanksgiving weekend tradition. This place was the absolute best! We will plan to stay here now each time! The house and all it’s extras were top of the line! And the service we receive from Gaste Haus Schmidt is amazing. Each year we are able to check in hours before the actual check in time, which makes things so much easier for us!!! Thanks for a great house and great customer service!! Y’all make our family time so awesome! !